Garden Life Magazine Nov 2016. Father Nature's community growing work. Brixton Blog June 2016 - The Big Park Sleepover. The Huffington Post June 2016 - Father Nature growing plants...and people. 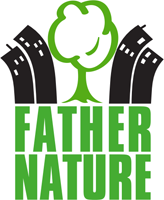 Lambeth Talk May 2016 - p. 9-10, Father Nature profile. Recycleopedia 2015 - Father Nature: Reclaimed timbers transformed into garden planters. "It’s good to see what neighbours can do together." "It’s an amazing way to bring people and neighbours together. It makes the place look nicer. There should be more gardening done around the world."